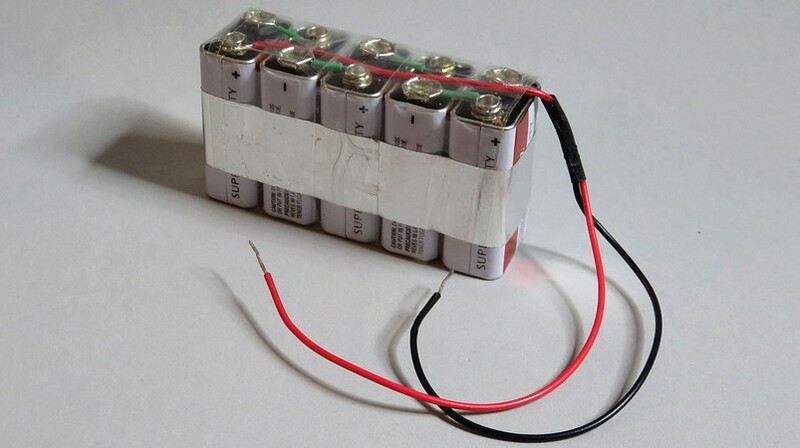 Let's make some old batteries. 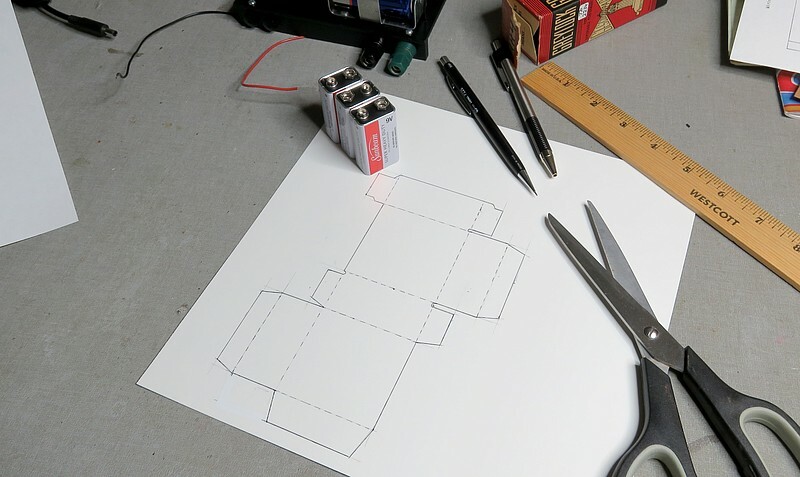 Elmer said to use three 9 volt batteries in series for the B battery, so we'll make a box for them. 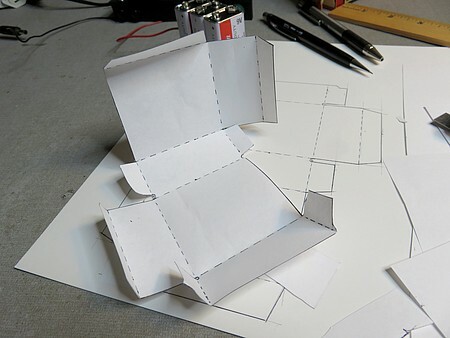 A paper box was made to test the template, which was then transferred to thin cardboard. 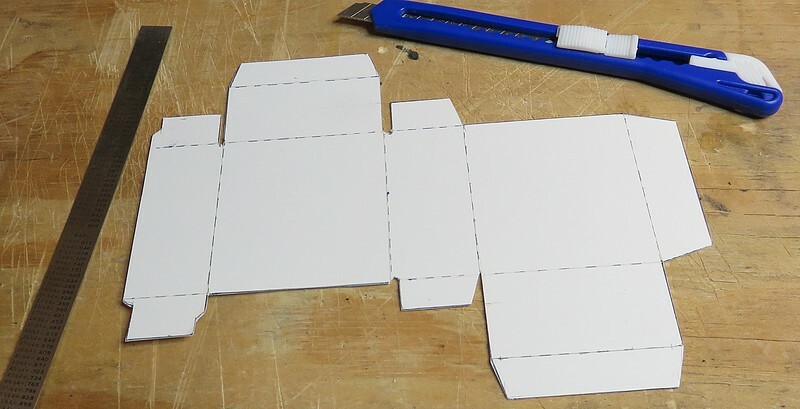 The dotted lines have been lightly scored with the utility knife. This took most of a Sunday morning. I have a new respect for box designers. While making this box, my back was hurting so bad I couldn't think straight. Two days before, I hurt my back while putting on my SOCKS. It felt like house current shot through my lower back. By Sunday I was in agony. To make matters worse, my back seemed to be possessed and to want to incapacitate me. 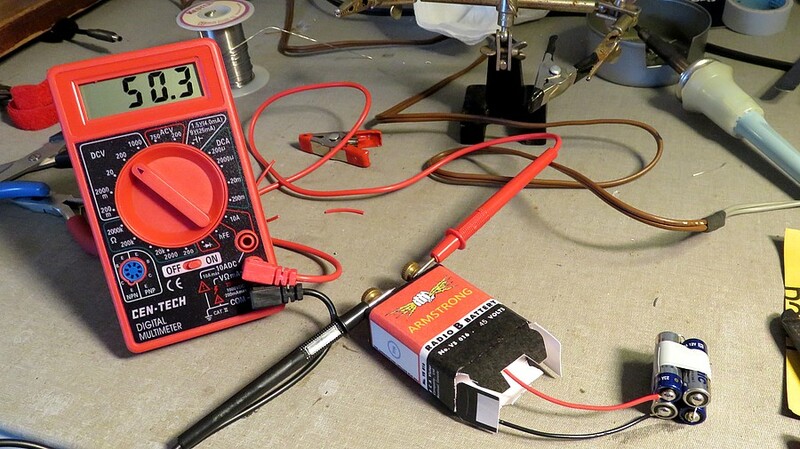 It was like, "Oh, did you get comfortable making your stupid little battery box? Well, take THIS!! And THIS!!!" as I became paralyzed in unbelievable torment. "Do you need to cough? Cough gently, like a little girl. That's it, cak, cak, cak. I'm sorry, that sounded too much like a real cough. Take THIS!!" My back spasmed in blinding pain. It took 15 minutes to walk 10 feet to the bathroom, and that is no exaggeration. In the bathroom, the torture got worse, but will not to be described here. This went on for a week. Every aspect of my life revolved around my lower back. 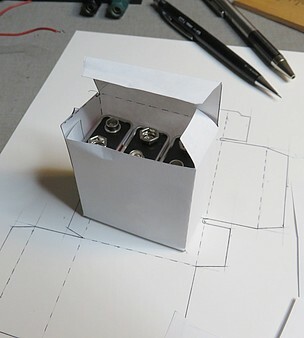 Connecting the batteries and finishing the box. At least I was productive, though I couldn't do much else at the time. saying was made famous when it was found as graffiti in the subway of New York City in 1965. 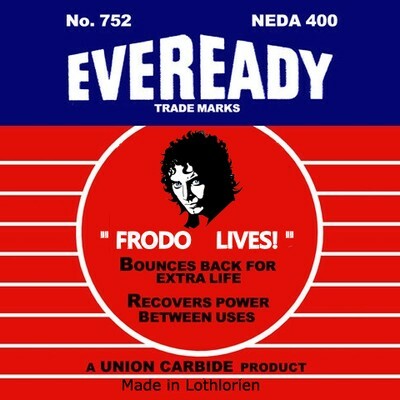 Notice the battery on the right was manufactured in Lothlorien. The batteries were from the Dollar Store, so this 27 volt battery cost $1.50. Elmer would be pleased. 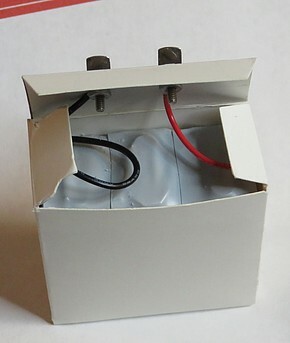 This box will also hold four 10.5 volt microphone batteries and you'll have a 42 volt battery. (Excell A177, Duracell PC177A, Eveready E177, Energizer EN177A.) However, the batteries will set you back $22 plus shipping and the ghost of Elmer Osterhoudt will appear in your dreams. (If this actually happens, please let me know what he looks like.) The PDF file of the box is here. 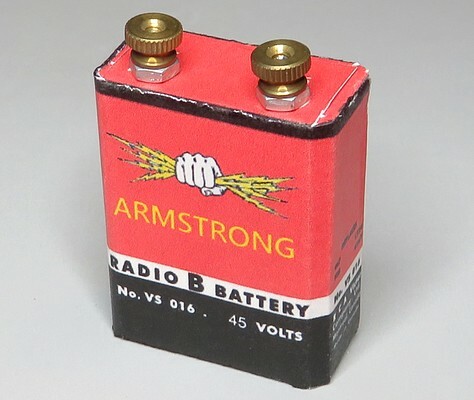 Battery art can be found on a Russian site hosted in Canada called "Radio Nostalgia." I can't read it, but "radio" is spelled "радио." Most of the labels are in the "Unsorted" directory, here. 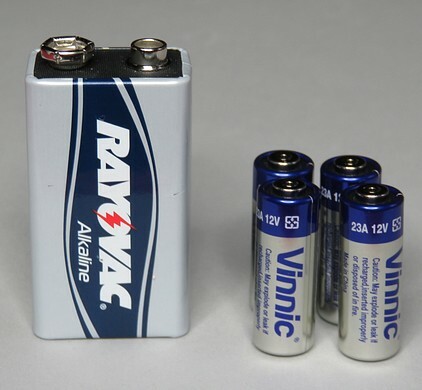 To thee right of the 9 volt RAYOVAC are 12 volt batteries designated "23A." These can be obtained from ebay for about 50¢ each. 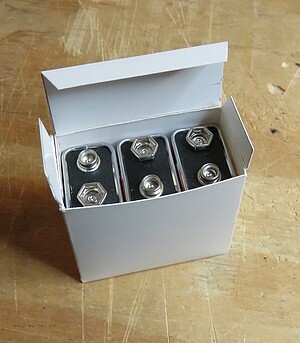 Inside each one are 8 LR44 button cells, so we're going to have 32 Chinese made LR44s in series. What could possibly go wrong? The LR44 is also known as CR44, SR44, 357, SR44W, AG13, G13, A76, A-76, PX76, 675, 1166a, LR44H, V13GA, GP76A, L1154, RW82B, EPX76, SR44SW, 303, SR44, S303, S357, SP303, and SR44SW. I didn't bother making my own box. I just downloaded the box art. printed it, glued it to a greeting card, and cut it out. The lightning bolt in the fist reminded me of what was happening to my lower back. 50 volts with no load. 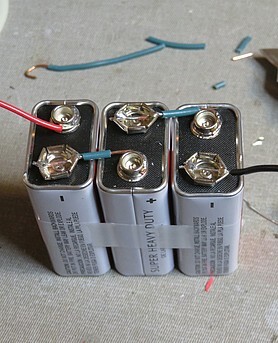 After an hour of use the voltage dropped to 47 volts. The 23As were not designed for continuous use. 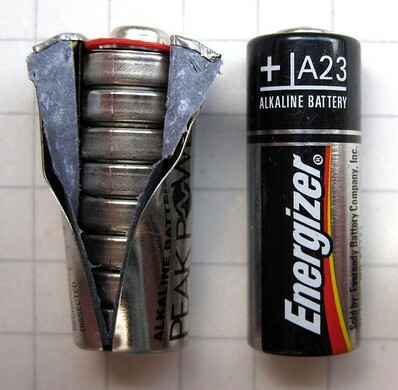 Another 45 volt battery. $2.50 to make it yourself, $30.00 if you buy one from a "thief," as Elmer would say. 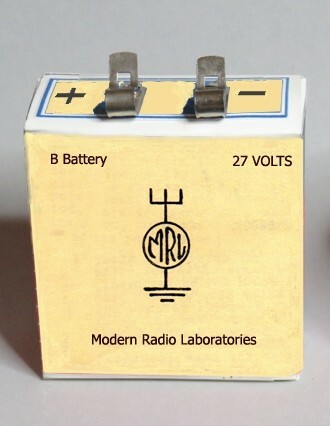 Why didn't Elmer Osterhoudt make MRL "B" batteries? He made everything else, and he sure made a lot of boxes. 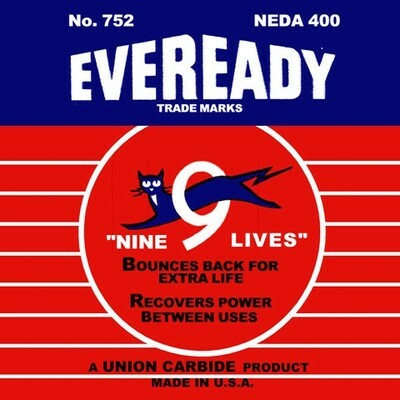 The "PP3" 9V battery was invented in 1956 by Eveready. MRL sold 9V Burgess batteries. In 1983 they were listed in the catalog for 35 cents. Elmer could have made 27 volt B batteries and sold them for $1.50. Another MRL mystery. And now, without further ado, a demonstration of the radio. CAUTION: loud squealing ahead! May be boring. Fast forward to the end for some shortwave. 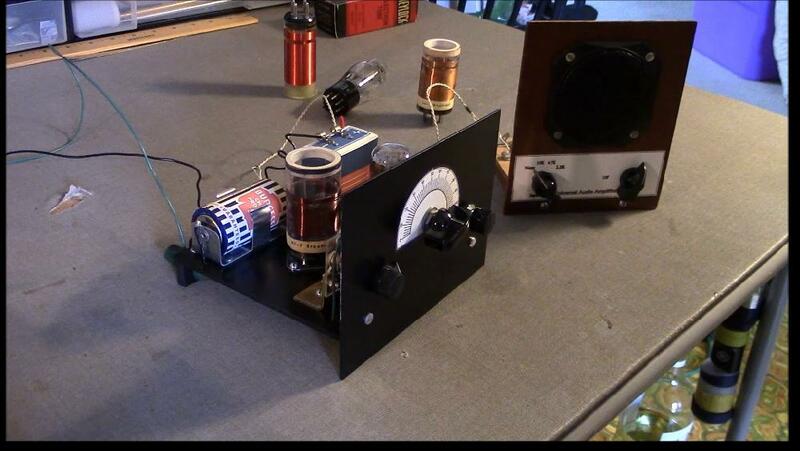 If you've enjoyed this, view MIKROWAVE1's Alfred P. Morgan One Tube Radio video. Part 1. Part 2.